Jesus took with him Peter and James and John, and led them up a high mountain apart, by themselves. And he was transfigured before them, 3 and his clothes became dazzling white, such as no one on earth could bleach them. 4 And there appeared to them Elijah with Moses, who were talking with Jesus. 5 Then Peter said to Jesus, “Rabbi, it is good for us to be here; let us make three dwellings,[c] one for you, one for Moses, and one for Elijah.” 6 He did not know what to say, for they were terrified. 7 Then a cloud overshadowed them, and from the cloud there came a voice, “This is my Son, the Beloved; listen to him!” 8 Suddenly when they looked around, they saw no one with them any more, but only Jesus. 9 As they were coming down the mountain, he ordered them to tell no one about what they had seen, until after the Son of Man had risen from the dead. The original Gospel of Mark had no stories of Jesus’ alleged post-death appearances to his disciples, only a statement by a “young man” at the empty tomb that Jesus would appear to his disciples in Galilee at some time in the future. The subsequent Gospels, canonical and non-canonical, have increasingly elaborate stories of a bodily resurrected Jesus making appearances to his disciples in a transformed body that could walk, talk, and eat, but could also perform supernatural feats such as walk through locked doors, teleport between cities, and levitate into outer space (or at least into the clouds). Conservative Christians assure us that these Gospel stories were written by eyewitnesses and therefore they can be trusted as historical facts. But take a look at the story above. Notice that Jesus’ body is “transfigured” in this story too. Not only that, but two long dead Jewish prophets appear before the eyes of the disciples and…Jesus talks to them! One of the men Jesus allegedly talked to in this scene was Moses, you know, the guy who allegedly lead a mass horde hundreds of thousands or even a couple million Israelites out of Egypt, across a dry sea bed, to wander around the Sinai for 40 years, and then invade Palestine. But there is a problem: There is zero good evidence of any of these persons or events. Zero. 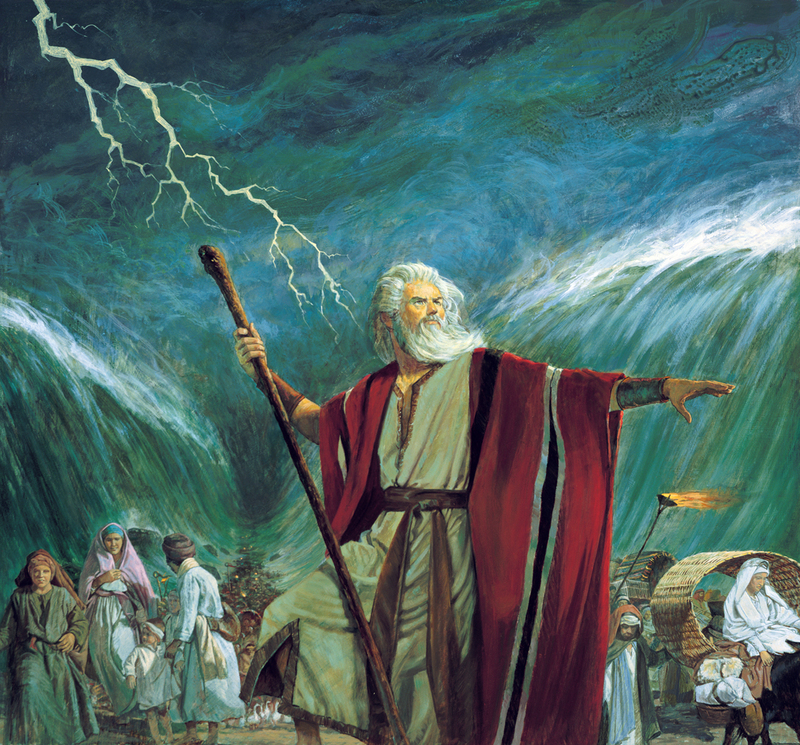 The overwhelming majority of archaeologists and Near East experts now believe that Moses was a fictional character in ancient Jewish folklore. There was no Captivity in Egypt. There was no Exodus, no Passover, no wandering for 40 years in the Sinai, and no Conquest of Canaan! As we saw in a previous post, even evangelical Christian Egyptologist and archaeologist James Hoffmeier admits that there is no clear evidence for any of these events or persons. A fictional character in a tall tale. So in the story of the Transfiguration, Jesus was talking to someone who did not exist. Jesus was talking to a fictional character! The Transfiguration story is FICTION. So why on earth should anyone believe that the other stories in the Gospels in which Jesus’ body once again experiences a metamorphosis and takes on superhero powers are historical facts??? We shouldn’t. These are tall tales, and nothing more. The early Christians may have experienced something (mistaken identities, vivid dreams, illusions) that caused them to believe that Jesus had appeared to them, but the story of the Transfiguration is excellent evidence that the detailed appearance stories in the Gospels are literary/theological fiction. Though… the historicity of the Resurrection would prove stuff the other way, wouldn’t it? And we have at least two independent sources for the Resurrection, Paul and Mark. Which is gold in ancient history. Plus… Hebrews, Jude, James, 1 Peter. Now we have six. Plus Josephus and Tacitus corroborating the New Testament narrative. Plus we have confirmation from a source that an investigation into the accounts proved the account reliable (Luke). Plus we have John, who is adamant that Jesus was in fact touched and seen (see 1 John). And since all that can be done is dismiss this with a wave of the hand, rather than real engagement with the sources… I’m going to be a consistent historian and see the validity of the fact of history. So if I was able to give you independent sources, how many would it take for you to believe that I jumped up into the air and started flying around like Superman? Would any amount of testimonial evidence convince you? How adamant do my sources have to be to convince you that I can fly using magic? None of your other sources claim that anyone saw a BODY! Your lengthy diatribe says basically just says “the Gospels aren’t reliable historical documents”, right? What’s that got to do with whether Jesus was resurrected or not? Paul never gives a description of what he saw. For all we know, all Paul “saw” was a bright light. Without the Gospels, there are no accounts of anyone seeing a BODY.